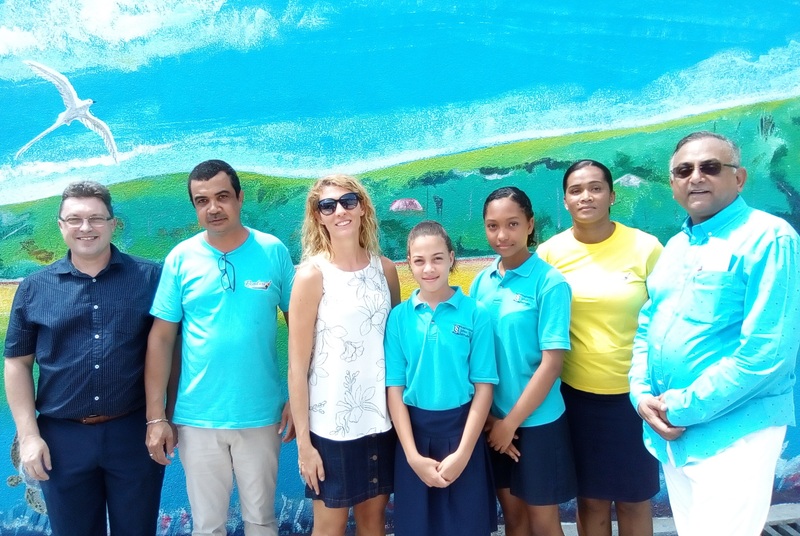 Richard Pitman, Head of KS4&KS5 Art&Design, Amanda Amade in Year 11, Shamara Adams in Year 7 along with Angie Geehan from the Arterial Network Seychelles, attended a press ceremony at Penlac today to say thank you to Mr A Gafoor Yakub, Chief Executive Officer of Penlac and his staff for the kind donation of paints. 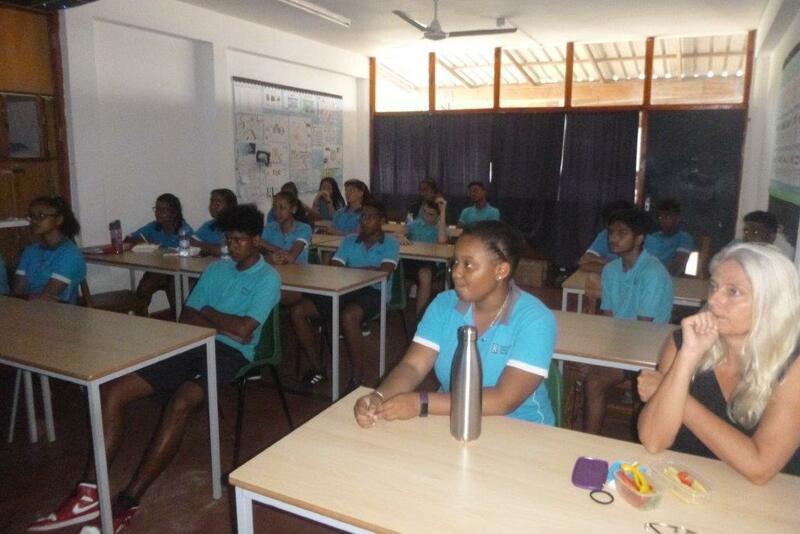 Students at ISS are currently using the paint to create school Eco-Murals which when finished will be displayed on the school walls, highlighting the different terrains and effects that humans have on these environments in the Seychelles, from the mountains, forests, mangroves to the sea. 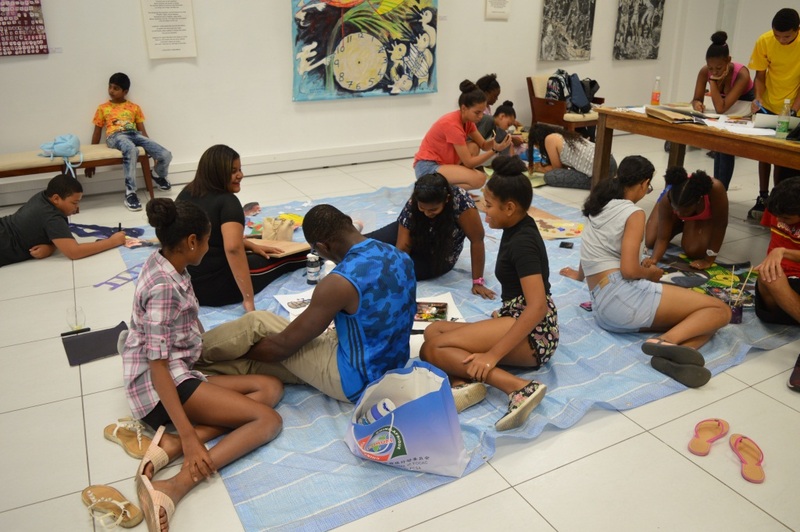 On Saturday 23rd March a group of students from ISS and their art teachers, participated in a, ‘Big Draw’ event at the Eden Art Space sponsored by Arterial Network Seychelles (ANS). This year’s ‘Big Draw’ theme was, ‘Games’ and it was decided to create a giant Snakes and Ladders game board with famous historical and political characters climbing the ladders or sliding down the snakes. Students from ISS as well as students and their teachers from the Independent School and Plaisance School all worked together to bring the, ‘Snakes and LAdders’ board game together and the final result as you can see was a great success! Each school is going to receive a large scale printed version of the board game, plus we have been given the actual board, as ISS had done most of the preparation work. The size of the work is large at 3 metres by 3 metres, so we will need to find a suitable home for it. In the mean time we are hoping it can go initially on display in a public space for all to see. 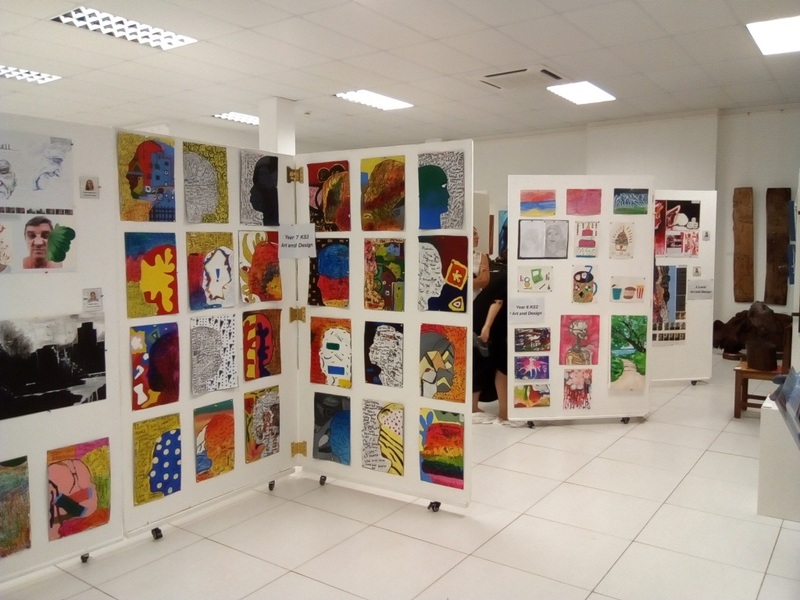 The 2nd annual ISS Art Show opened yesterday at the Eden Art Space Gallery, Eden Island showcasing the artistic talent of students from Reception through Primary, Secondary, to IGCSE and A Level. The gallery run by the Arterial Network Seychelles an NGO for local artists, once again hosted the event and the show started with a number of speeches by Mr Martin Kennedy Chairman of Arterial Network, Ms. Madeline Woolfenden Head of Secondary, Mr Frederick Ajode Head of KS2/KS3 Art and Design and Mr Pitman Head of KS4/KS5 Art and Design. The student work on display includes examples of how pupils have worked in different mediums from painting, drawing, mixed media, etc on range of topics and themes. Once again thank you to Michella Marzocchi the Gallery Manager for assistance and Michelle Griffith’s, Operations Manager at Arterial for promotion and Martin Kennedy for allowing us to hold the event. Thank you also to the support from the school and staff, from Mr Prince and Board of Governors for funding the drinks and nibbles, transportation of boards and posters by Mr Glenny Stravens and anyone other staff who was involved. Also thank you to Mrs Angie Geehan and Mrs Nicole Chionni from PTA for setting up the food and drinks. Finally a thanks to Mr Ajode and myself (pat on the back) for setting it up. It takes a lot of work to organise an event, so if you haven’t seen the work, please take the opportunity to see the show and support the students. The show is open to Friday 29th March. expectations they would have if they entered this profession.